When considering the best watersports destinations in India, Goa is likely to come to mind first. This isn't surprising as watersports have become hugely popular there, now that they're no longer only being offered by luxury hotels. However, there are many other unlikely destinations all over the country where watersports are available. Due to their dramatic backdrops, they're watersports with a twist! Think river rafting past remote Buddhist monasteries and kayaking through tropical palm-lined canals. It's sure to be an experience of a lifetime. Read on to discover where to get wet and wild in India. When it comes to watersports in Goa, you name it and you're likely to find it! This includes jet skiing, windsurfing, parasailing, water skiing, wakeboarding, kite surfing, catamaran sailing, and all the fun kids' activities such as banana boat rides. The majority of the action happens on and around the most developed beaches of Calangute and Baga in north Goa. However, watersports take place on beaches all over the state. This guide to adventure sports in Goa has more information. It's also possible to go white water rafting in Goa during the monsoon season. Think Goa is too touristy? 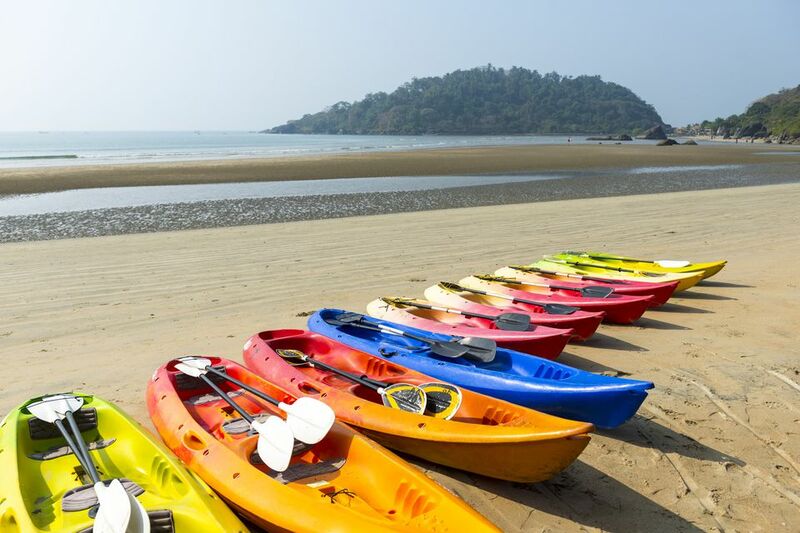 Over the border, Gokarna is a favored alternative and all the usual action-packed watersports happen there as well, particularly on Om beach. What's more, Gokarna's placid beach breaks make it a great spot to learn to surf. Cocopelli Surf School has a basic guesthouse and offers various surfing courses. Parasailing, jet skiing, boating, and surfing are all available in the pristine Andaman Islands, a union territory of India in the Bay of Bengal. However, it's the scuba diving, snorkeling and undersea walking that really stand out. Havelock Island has the largest number of scuba diving companies, and the experience is better there than at Port Blair. For beginners, the companies all provide about 15 minutes of basic training and then a 45-minute dive. Recommended companies include Dive India, Blue Corals Dive, and Ocean Tribe. Or, choose a dive and stay package at popular Vinnie's Tropical Cabanas and Dive Center. Here are some other top places to stay on Havelock Island for all budgets. If you're interested in snorkeling and undersea walking, head to Elephant Beach on Havelock Island. Can't make it to Havelock Island? The Rajiv Gandhi Water Sports Complex at Port Blair offers all kinds of watersports. Alternatively, North Bay Beach (north of Port Blair) has good snorkeling around its coral reefs. Other watersports take place there as well. The tourist season runs from October until May. With a huge network of tranquil backwaters, lakes, and rivers, Kerala is an ideal destination for laid-back kayaking and canoeing and even bamboo rafting. Kerala Kayaking offers daily kayaking tours through narrow backwater canals and to villages. The starting point is in Alleppey. Head to Periyar Tiger Reserve or Kerala's lush Wayanad district for bamboo rafting. It takes place at various locations in Wayanad, including Kuruva Island and Pozuthana (near Vythiri). Check out the bamboo rafting trips offered by Ciceronis and Thrillophilia there. If you're more interested in adrenaline-pumping watersports such as parasailing and jet skiing, you'll find them at Payyambalam beach in the Kannur district of northern Kerala. There are surfing and windsurfing at Varkala and Kovalam beaches further south. Jellyfish Water Sports offers a vast dedicated space for watersports (predominantly kayaking and Stand Up Paddling) and adventure activities on the Chaliyaar River near Calicut. Imagine gliding along a river past ancient Buddhist monasteries and through spectacular Himalayan gorges. High-altitude river rafting in Ladakh is quite unlike anywhere else in the world. It takes place on the Indus River and its tributary, the Zanskar River, which flows across the region. However, the Zanskar River is reserved for the really adventurous, with Grade III and IV rapids. You can expect five days of intense rafting on some trips. Easier rafting trips, lasting for one to three hours and with Grade I and II rapids, happen around Leh. A popular route for beginners is Hemis-Stakna-Shey-Thiksey-Choglamsar. The best season for rafting in Ladakh is from June to August when water levels are high. Kayaking is also possible. There are a handful of decent travel agents in Leh that offer these activities. The best one is Wet N Wild Explorations. If you're wondering where to stay, these top homestays in Leh are inexpensive and comfortable. Holy Rishikesh, the birthplace of yoga in India, isn't only about spirituality. It's also a top destination for river rafting and kayaking along the Ganges. The shortest trips last for a couple of hours. River rafting can be combined with camping, and also trekking and zip-lining, for added adventure. These trips extend for a couple of nights. Longer rafting expeditions can be undertaken as well. Popular companies in Rishikesh include Red Chilli Adventure, Rishikesh River Rafting, White World Expeditions, and Explore Watersports. Stand-up paddleboarding is another possible activity. Wet N Wild Explorations also operates in Rishikesh and provides equipment. If you're proficient in yoga, you might want to give Paddle Board Yoga a go! You might have heard about zorbing on land, but how about on water? Water zorbing has been introduced on Bhimtal Lake, about 45 minutes southeast of Nainital in Uttarakhand. It's a big hit with tourists! Other watersports, such as kayaking and boating, also take place in the area, which is renowned for its lakes. Being in the mountains, it's ideal for escaping the searing summer heat in India. The most reliable waves on the Indian mainland can be found at the fishing-turned-surfing village of Covelong, south of Chennai in Tamil Nadu. It has a remarkable social surfing movement, and a newly constructed surfing facility with guest rooms and cafe right on the beach. A little further down the coast in Mahabalipuram, there's a thriving surf and backpacker scene. Mumu Surf School gives lessons and professional coaching. This guide to the top places to surf and get lessons in India has more information.